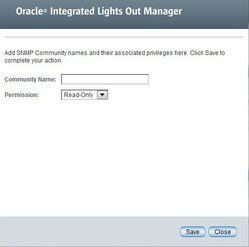 Scroll to the bottom half of the SNMP Management page to find the SNMP Communities dialog box. Click the appropriate community radio button. The Edit Community dialog box appears. Update community properties, as needed. The Add Community dialog box appears. If you are adding a new community, type the name of the community in the Community Name field; otherwise, proceed to the next step. The community name can contain up to 35 characters. It must start with an alphabetic character and cannot contain a space.